Myposeo Pro’s SEO Audit is a powerful module allowing you to perform a global competitive analysis of the ranking of all players in a market in search engines. 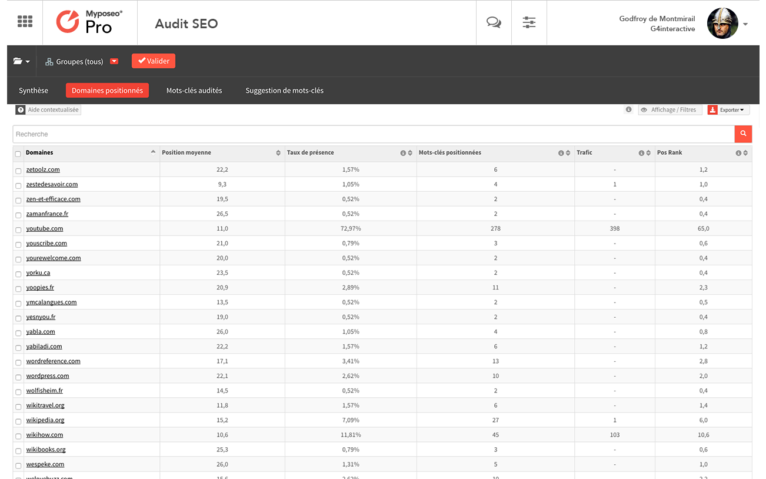 Create your audit on a defined number of keywords and a precise depth of analysis up to 10 pages. Choose up to 2,000 keywords to audit, sort them into groups and choose your engine. Myposeo collects all results up to 10 pages deep. All custom competition and visibility indicators are calculated by our algorithms. You can view your data in graphs and tables for all websites present. 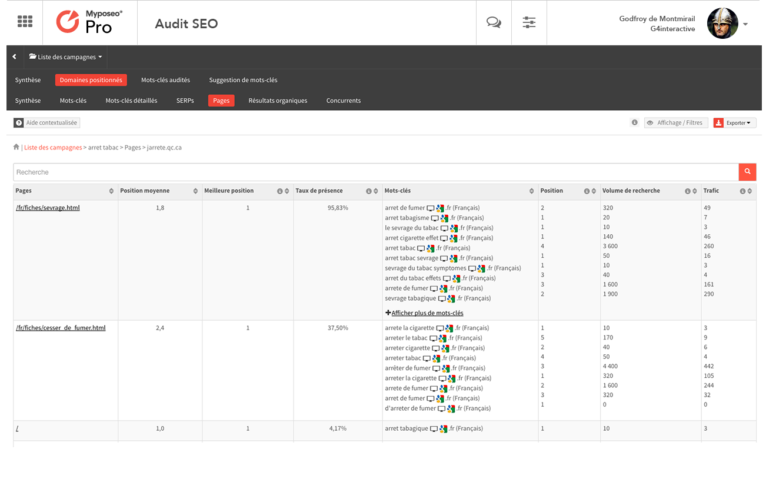 The audit launches an analysis from a list of keywords, calculates their positions in search engines and detects the other sites also positioned. The analysis depth can extend over 10 pages. Attendance rate allows to know the number of keywords on which an advertiser is present. A website present on 2 keywords on 10 has 20% attendance rate. PosRank is an unique indicator from 0 to 100, allows to know the website’s global position on a set of expression. 100 being the best possible score (if all website’s keywords are in 1st position). Discover all the sites raked on the first 10 pages of Google for your semantic field. 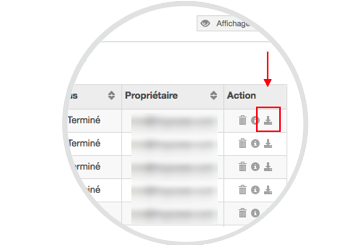 Many relavant indicators make it possible to classify the actors most present on SEO and PPC on your keywords (POSrank, presence rate, number of keywords ranked, average position etc.). Perform an analysis of the audited keywords to know precisely the composition of the results pages (SERPs). The presence of knowledge graph, AdWords links, Universal Search or the number of ads on each page will allow you a unique understanding of the search engine. All pages and ads displayed in search engines. Detect the landing pages that are best ranked for your competitors’ sites. Get all the ads displayed by Google on the results pages. 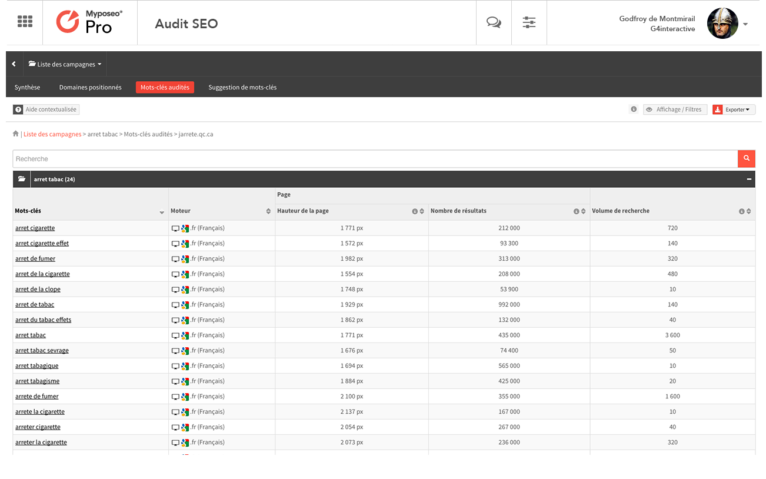 How to use the SEO Audit tool? 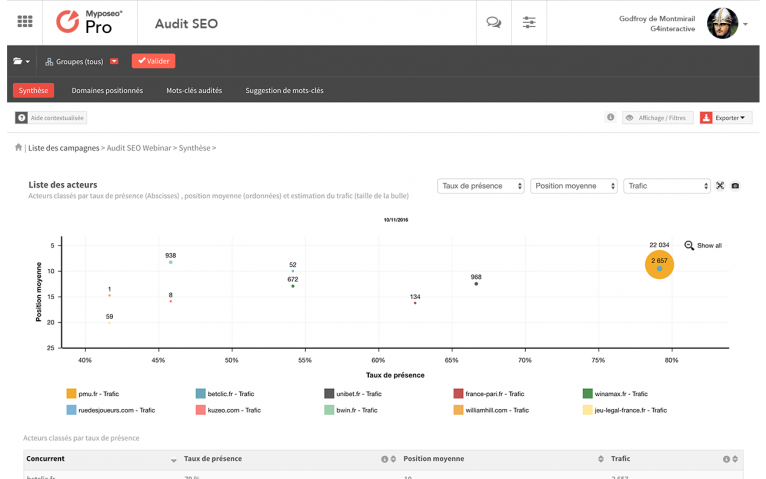 Consult our use cases dedicated to the SEO audit tool. Learn how to use Myposeo Pro to track and optimise your website’s visibility.